Microwave assisted synthesis is a well established method in organic and inorganic chemistry. It is also used in material science to realize novel carbon nanoparticles exhibiting fluorescence properties. The results presented here are related to a microwave driven solvothermal process used for the conversion of amino acid and 1,2-diaminoethane into fluorescent solutions. Arginine, lysine and glycine were used as amino acids. The process temperatures are set in the range of 80° to 140 °C and the maximum process pressure is 4.5 bar. The process duration is set from 5 to 30 minutes. The fluorescence effect is increased with increasing temperature. The prepared aqueous fluorescent solutions can be used as media to induce fluorescence in textile substrates. 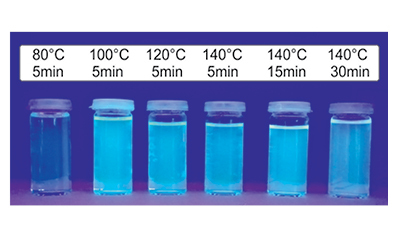 The current study can be understood as a first proof-of-concept of a very simple microwave-assisted solvothermal synthesis of fluorescent compounds useful for the modification of different substrates.